Hey Siri, who's the best digital assistant? SAN FRANCISCO -- Cortana's learning the neighborhood. Google's digital assistant can't tell a joke. And Siri apparently has a thing for the metric system. Those are just a few of the things I learned after staging a face-off between the three leading digital assistants. Apple's Siri and "OK Google" - they're not big on personification at Google - are now standard on smartphones; Microsoft recently added its Cortana service to Windows 10, so it works on PCs, too. Now that just about anyone can talk to their phone or computer, we wanted to see what happens when you try. Unsurprisingly, none of the assistants are perfect. Surprisingly, they do have distinct personalities, even if they're just deliberate artifacts of their creators. I asked the same 10 questions of each service, using an iPhone with Siri, a Nexus phone with Android's "OK Google" and a Microsoft Surface Pro tablet with Cortana. First up: Some basic factual questions. All three did pretty well when asked, "What's it like outside?" Cortana earned extra points for answering with a spoken weather report. 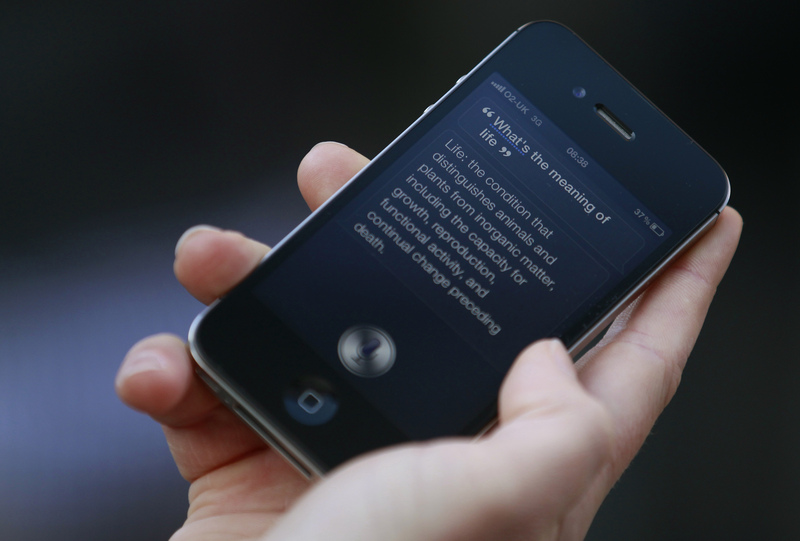 Google and Siri each showed a screen image that listed current conditions and a forecast. All three supplied President Obama's age. When asked "What's his wife's name?" they all remembered that the question referred to the president, and correctly identified the First Lady: Michelle Obama. Similarly, they all knew the length of the Golden Gate Bridge. But for some reason, Siri answered in meters, while Cortana and Google stuck to feet. Next came more complicated tasks, like finding the nearest pharmacy. Google and Siri listed three within a half-mile of The Associated Press bureau in downtown San Francisco. But neither mentioned the drug store on the ground floor of the building where the bureau is located. Cortana did. Posing questions is hungry work. I asked for help making a lunch reservation at Credo, a fancy restaurant around the corner. Siri and Cortana were stumped, but Google automatically fired up the Open Table app on the Nexus phone, with the form already filled out to make a reservation. Too bad the place is so trendy; it was booked for weeks. Ever feel like ducking work to catch an afternoon movie? (Shhh! Don't tell my editor.) All three assistants had local movie listings at their digital fingertips. But Siri led off with a new release at a theater just half a mile from the AP bureau. With a couple of taps, Siri had opened Fandango, an app that lets you buy tickets online. Google also connected with Fandango. Cortana had more trouble; Microsoft lags behind Apple and Google in the number of apps that work with its software, and I couldn't get the right Fandango app to load on a Surface tablet. Finally, a personality test. I challenged each to tell a joke. Siri had the best answer: "If I told you a joke in my language, I'd have to explain it." Then I tried the famous line from "2001: A Space Odyssey" in which astronaut Dave Bowman tells the ship's computer: "Open the pod bay doors." Cortana knows the right answer: "I'm sorry Dave. I'm afraid I can't do that." But Siri had a better one: "Doesn't anybody knock anymore?" To be clear, these aren't the witty rejoinders of some artificial intelligence. The creators of Siri and Cortana thought it would be fun to pre-load each service with humorous answers to predictable questions. Google doesn't bother with such frills. Sticking to its search-engine roots, "OK Google" answered the "2001" question by silently presenting a series of Internet links, starting with one for a YouTube clip from the movie. Likewise, when asked about the meaning of life, Siri and Cortana were both ready with a quip. Google just recited a dry definition that only a biologist could love: "Life is the condition that distinguishes animals and plants from inorganic matter. ..."
All three services are good on factual questions. Siri's programmers have the best sense of humor. Google stays focused on the task at hand. And Cortana is quickly catching up to both of them.